All the contents in this page are the rumors about new iPad for 2018. But it is a pity that Apple has not released any new iPad this year. Looking forward to seeing this product as soon as possible. As we all know, the new iPad for 2018 will be launched in this month. So now lots of users are eager to know something about the new device in advance. To meet your requirements, we have collected some rumors and news about the new iPad in this article from which you can know the release date, design, features, tech spec and price of the new iPad. Now let's begin! Tips & Tricks: How to Do after Getting the New iPad? It's been 15 months since the last iPad Pro launched at the company's developer conference, WWDC, in June 2017. However, on the WWDC 2018, Apple only announced the iOS update and other events related to software. Hence, majority of people think that the new iPad is very likely to be released at the special event on 12 September. Except for iPad X, it will launch other devices like new iPhone, Apple Watch, MacBook, etc. as well. Just keep eyes on the Apple Special Event on September 12, 2018. The design of new iPad for 2018 might be similar to the iPhone X, such as the no Home button design, Face ID, etc.. But it is certain that there would be some changes. Now let's see the detailed design and features of the new iPad 2018. Last year, Apple has applied the OLED display to iPhone X, which allows for thinner designs, higher brightness levels and greater contrast. So this year, it is expected that iPad X would employ the OLED display as well. But this is hard to say for sure because this display technology has one bad point - supply shortage. Hence, LCD or OLED, it is still a question now. Another possible design of the new iPad is the removal of Home button. That is to say, new iPad for 2018 would adopt an all-screen design, which would provide users with a larger screen. From now on, watching videos or playing games on iPad can be more enjoyable. As early as 2017 October, KGI Securities analyst Mini-Chi Kuo predicted that the new iPad X would include the TrueDepth Camera for Animoji and Face ID. And in July, 2018, developer Steven Troughton-Smith has tweeted that he had spotted more evidence that Apple will launch an iPad with Face ID. Therefore, we can forecast boldly that Face ID will replace Touch ID on the new iPad. All iPad users know that this device equips an Apple Pencil and this pencil stylus would get an update with the 2018 iPad range. So we can look forward to the change of the Apple Pencil this time. According to DigiTimes, the new iPad X will come with an 18-watt USB-C power adapter. This adapter will reduce the charging time by 50 percent. In other words, the charging speed of iPad will be effectively improved. Since the new iPad for 2018 is a high-end product, people are expecting a high price tag to match the upcoming device. Here you can refer to the price of the iPad Pro launched in 2017. For example, the 2017 10.5-inch iPad Pro starts at $649 while the 2017 12.9-inch iPad starts at $799. However, you should also take other unstable factors into consideration, such as the exchange rate. How to Do after Getting the New iPad? There is no doubt that you have saved something important on your old iPad. So to avoid data loss, you'd better backup the files on your old iPad beforehand. Here is a professional third-party software that can help you accomplish the backup easily. This tool is MobiKin Assistant for iOS. 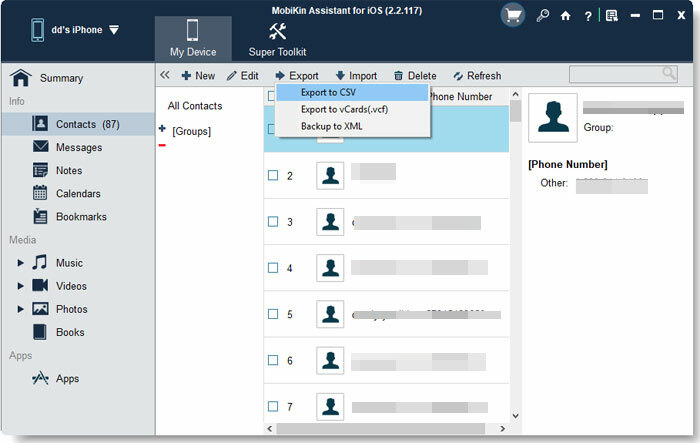 With it, you can manage the data on your iPad or iPhone without any hassle. Just click the icon below to download and install the program on your computer and then go with the tutorial to make a backup. Please ensure that the latest iTunes has been installed on your computer. Step 1. Launch the program on your computer and then connect your iPad to the computer with a USB cable. Step 3. Just tap on the wanted folder in the left panel and then the program will locate its contents in the right column. Tick off the files you want to backup and hit the "Export" button to save them onto computer. After backing up the files on your old iPad and sync them to your new iPad, you should not forget one important thing - remove the files on your old iPad. Here a simple deletion is not recommended for the reason that the deleted data can be easily recovered by some recovery tools. On the contrary, you need to use a professional iOS eraser software to permanently wipe out the data. Otherwise, your privacy saved on the old iPad would be disclosed after you give it away. In this case, MobiKin Eraser for iOS is what you need. 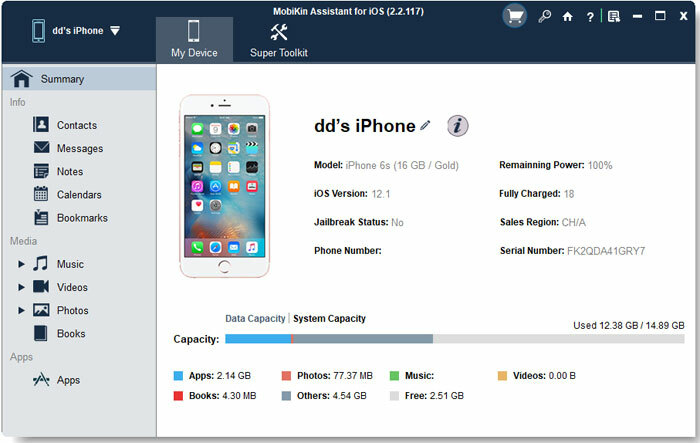 It empowers you to erase all files on iOS device, including the deleted files, existing data, privacy, system settings and so on. What's more important, the erased data is unrecoverable, which means no one has chances to filch your privacy after the erasure. It is powerful, right? Just download and install the tool on your computer by clicking the icon below. Then you can go to the page "How to Wipe/Erase iPad Data before Selling" to get the detailed tutorial. Now you must have a general idea about the new iPad for 2018, right? What do you think of it? Its changes are better or worse? Just share your opinions with us! iPhone Battery Draining Fast after Upgrading to iOS 11? 8 Tips to Fix It! How to Record iPad Screen Video?